The Flames had one of those nights on Monday, going down 4-0 in 28 minutes before an eventual 6-2 Avalanche win to give Colorado a 2-1 series lead. They picked up two simultaneous penalties—including too many men on the ice—to give up the Avs’ first goal on a 5-on-3. They got outshot 56-29. They even let UMass product Cale Makar score on his first shot in his NHL debut. But before things went full-on disaster mode for Calgary, Nathan MacKinnon’s wrist dug the initial hole they found themselves in. The wrist of the young Colorado Avalanche center was already responsible for his team’s win in Game 2, which came in overtime after the Avs tied it up with less than three minutes to play. 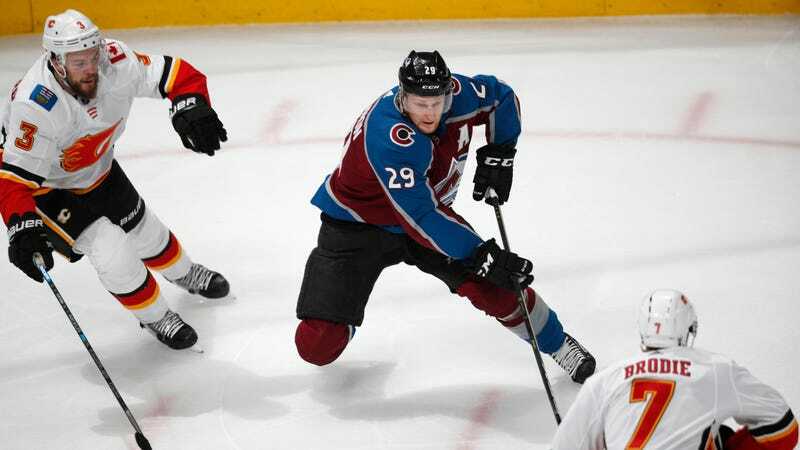 MacKinnon took a pass as he rocketed into the offensive zone, and with plenty of space, he knotted the series by firing a perfect shot above Mike Smith’s left shoulder. MacKinnon’s radiocarpal joint didn’t miss a beat when the series changed altitudes, because he scored the first two goals of Game 3 as well. On a five-on-three, MacKinnon had the luxury of all the space that appears when two opponents go to the penalty box, and he took advantage by gliding into a threatening spot and unleashing the power of his wrist shot, beating a blinded Smith for the 1-0 lead. On a powerplay later in the first, Mac completed what was for all intents and purposes a natural hatty. Taking the cross-ice pass from Mikko Rantanen, MacKinnon opened up a 2-0 lead by one-timing the puck through the 6-hole. To show that he is unselfish and kind and not a T-1000 on skates, MacKinnon assisted on Makar’s GWG to help give the kid and his family a beautiful memory, and then he let the rest of his team score three more. But make no mistake: That upset-minded wrist is evil, and it will kill again.